THE moment you mention Jalan Cochrane, the first thing that your mind conjures is the row of government quarters. However, there is another landmark that warrants equal attention, the Cochrane Road school. Established in 1957, the school started out as a small shack surrounded by cow barns. The school has since been moved to a nearby location and renamed SMK Cochrane Perkasa. The road was named after Charles Walter Hamilton Cochrane who was the British Resident of Perak from 1929 to 1930 and later the chief secretary of the Federated Malay States from 1930 to 1932. Rubbles remain: Many of the government quarters in the area have been demolished. Cochrane was born in 1876 and passed away in 1932. Many roads in the area were named after the chief secretaries who served the Federated Malay States, one of which is Jalan Shelley. However, it was the government quarters with beige walls, bright orange pillars and red roofs, built over five decades ago, that became the hallmark of Jalan Cochrane. The demolishing works of the pre-World War II government quarters in Jalan Cochrane begun recently. This was to pave the way for new quarters and a mixed development project. A recent visit to the area by StarMetro revealed that the demolishing works were in progress. Many of the government quarters have been brought down, while some of the old houses are still standing, though with cracked walls and peeling paint. These houses too would eventually be brought down. All that could be seen of the demolished homes were sections of broken walls, bricks, wood and metal scraps that were being cleared by the contractors. A former occupant of a house there, who only wanted to be known as Ali, said he moved out of his quarters in April to make way for the demolishing works. “Most of the occupants have moved out. Only some in Block C are still here, but I reckon they will have to move out eventually,” he said. Ali said he was at the site to collect bricks left from the demolishing works to build his new house. He added that since the demolition works started, many people especially former occupants had started gathering materials such as wood, metal, tiles and bricks from the site. The contractors are responsible for clearing the debris. “These materials are very expensive. All these are very old materials but they are very solid. The bricks are of good quality and reusable,” he said. 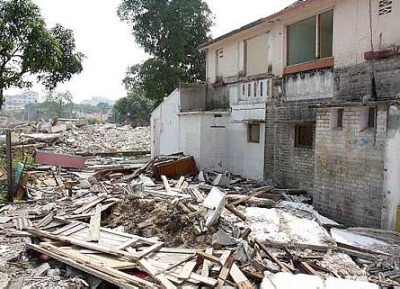 The occupants were issued notice in May 2010 by the property management division in the Prime Minister’s Department to vacate from the government quarters in Jalan Cochrane by Dec 15 last year. However, Cuepacs president Omar Osman sent a letter to the Chief Secretary to the Government Tan Sri Mohd Sidek Hassan in October last year, appealing for a one-year extension. The Residents of Cochrane Government Quarters Relocation Appeal Committee chairman Bustaman Hassan had also rejected the move, saying that most residents would not abide by the deadline and appealed to the Government for more time. Cuepacs also told the residents to disregard the Dec 15 deadline to vacate their homes until better terms were negotiated. Omar told residents to stay put regardless of whether they received a reply by Dec 15. He however, said they were not against the notice for the residents to move out but stressed that ample time and adequate shifting allowance should be given. In March this year, Bernama reported that the occupants had agreed to move to the People’s Housing Project (PPR) in Seri Alam in Sungai Besi and the PPR Kampung Muhibbah in Jalan Klang Lama. The families were given given a 14-day time frame to move and Kuala Lumpur City Hall (DBKL) helped the families to move by providing the transportation. Each family received RM2,000 compensation from the Government. StarMetro also reported in April this year that Cuepacs secretary (finance) Ja’apar Mansor said he was grateful to the Government for providing units that were closer to the city and to DBKL for helping residents move. The redevelopment will comprise new quarters as well as a mix development of commercial and residential building. The RM200mil project is expected to be completed within 30 months. It is undertaken by the Armed Forces Fund Board.